The police report listed the name of the deceased as Joseph Adam Randolph and his age as 48. It did not mention the name he had given himself, Stealhead Joe. The address on his driver’s license led police to his former residence in Sisters, Oregon, where the landlord said that Randolph had moved out over a year ago and had worked as a fishing guide. 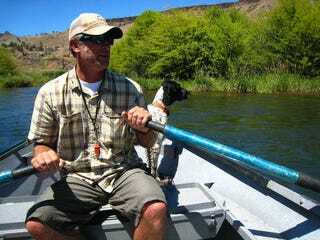 In fact, Randolph was one of the most skilled guides on the nearby Deschutes River, and certainly the most colorful—even unforgettable—in the minds of anglers who had fished with him. He had specialized in catching sea-run fish called steelhead and was so devoted to the sport that he had a large steelhead fly with two drops of blood at the hook point tattooed on the inside of his right forearm. The misspelling of his self-bestowed moniker was intentional. If he didn’t actually steal fish, he came close, and he wanted people to hear echoes of the trickster and the outlaw in his name.